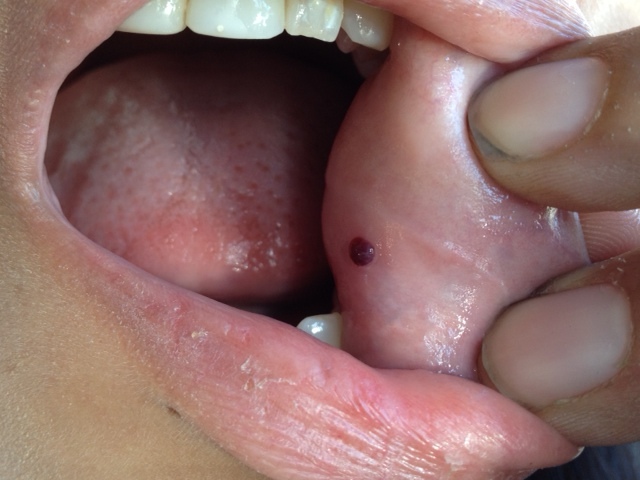 Blood blisters occur when there is a breakage of the blood vessels just below the lining of the mouth. They can be extremely painful and can interfere with your ability to eat. When you have blood blisters in your mouth, you can't chew your food in the right way and eating foods that are hot can result in a great increase in the pain. What causes this problem and what can be done about these painful lesions? These are what this article is all about. What Causes Blood Blisters in Mouth? This is a disease that is most commonly occurring in the elderly population. One can see a single medium-sized blister on the inner cheek or beneath the tongue that is filled with blood. They usually break open quickly, resulting in an open wound. Fortunately, they usually heal spontaneously, without treatment. Risk factors for the condition include diabetes, steroid use, and mouth trauma. If you are allergic to some foods, you can get blood blisters in your mouth after eating the offending food. This is commonly seen after eating citrus fruits. The only way to take care of this problem is to stop eating the food causing you the problems. You need your platelets to keep from bleeding and to make clots when you do have an open area in your skin or mouth. If you suffer from a low platelet count, you can get blood blisters inside the mouth. This is usually called idiopathic thrombocytopenic purpura and can develop in anyone. Without enough platelets, you can get blood blisters in mouth. If you eat a diet that is too low in vitamins, you can also get blood blisters. Deficiencies of vitamin C and vitamin B12 are known triggers to have blood blisters in your mouth. Certain medications can result in an allergic reaction. The allergic reaction can show up as a mouth blister. If you eat foods that are hard or foods that are too hot, you can cause damage to the lining of the cheeks and this can result in blood blisters. If you eat your food too fast, you can accidentally bite the inside of your cheek or your tongue. You need to pay attention to your eating when you eat so that you don't get blood blisters. Some people are infected with the herpes simplex type 1 virus, which results in oral herpes. Signs you have oral herpes can be blood blisters in all parts of the mouth and lips. These are painful lesions that can bleed and can result in systemic symptoms, such as muscle aches, fever, and fatigue. Oral herpes outbreaks can come and go and are particularly associated with stress. People who abuse alcohol can get ulcerations of the mouth which can lead to blood blisters inside the cheeks or under the tongue. Miscellaneous causes of mouth blood blisters include having a skin infection inside your mouth, having bowel disease, Behcet's syndrome, high blood pressure, problems with dentures, and neutrophil deficiency, being under hormonal stress, eating or drinking acidic foods, etc. You should see a doctor for antiviral or antibacterial medications if the blood blisters are due to bacterial or viral conditions. The doctor may also prescribe medications for the pain you are probably experiencing. In some cases, the doctor may recommend ulcer gels, medicated toothpastes, medicated mouth washes or steroids to treat your blood blisters. If you have blisters because of a deficiency in vitamins, you can take special supplements to round out your diet. You should eat a well-balanced diet and avoid eating acidic or spicy foods that have a tendency to irritate the lining of the mouth. You should also avoid toothpaste that has an elevated content of sodium lauryl sulfate. You should avoid squeezing any blood blisters you get. Some people believe this will get rid of the blisters, but in fact, it will just cause more irritation and ulceration. You can get a subsequent bacterial infection if you break the blisters and it will take longer to heal them. Popping the blisters with a needle will only be painful and will make the problem worse. Let the blisters heal on their own and they will usually go away quickly. You should not use a toothbrush when you have blisters in your mouth as this may only aggravate the tissues. Even a soft toothbrush can be irritating to the lining of your cheek. Rather than use a toothbrush, gently use your fingers to clean your teeth, resuming the toothbrush when you are healed. There are some home remedies you can try to get rid of blood blisters in mouth. One of these is to use ice. Putting the ice on the blister will cause the blood blisters to constrict, which will stop the bleeding. Witch hazel is an astringent that will lessen the pain and dry up the blisters, reducing inflammation in the process. Try cucumbers, which contain silica. Silica is a trace mineral that makes the connective tissue stronger. If you apply it to the blood blister, the swelling, inflammation, and pain will be reduced. Aloe vera can heal blood blisters because it has anti-inflammatory properties. It will also cool the area and help relief the pain. Sandalwood powder can be mixed with rose water to make a paste that can be applied to the blood blister. It absorbs heat away from the blister so that healing takes place faster. It also helps with the inflammation and pain. Turmeric paste can also be used, mixed with rose water or honey. It is an antiseptic that may keep you from getting an infection. If you want to try more home remedies, click HERE to find more options.